Consider the benefits: "The top 10% law, recently amended to admit the top 8% of graduates, has not only boosted diversity, but it has also brought other benefits. Since the mid-1990s, the graduation rate at UT-Austin has risen steadily. Studies showed the graduates admitted under the law outperformed others with higher SAT scores." We now wait to see what the highest court decides. In a University of Texas case, justices consider whether affirmative action can be justified if a school is achieving diversity without using race. September 27, 2012, 5:11 p.m.
AUSTIN, Texas — After a U.S. appeals court struck down race-based college admissions in Texas 16 years ago, the first Mexican American woman elected to the state Legislature proposed a simple change that transformed education in the state. Rep. Irma Rangel said all students who graduated in the top 10% of their high school class should win admission to the state's colleges, including the highly regarded University of Texas. Her bill, signed into law by then-Gov. George W. Bush, opened the door to higher education for Mexican American students from the Rio Grande Valley, for black students from Dallas and Houston and for rural white students. It also changed the University of Texas at Austin. Last year, 36% of those admitted under this policy were Latino or black, double the percentage of "underrepresented minorities" in 1996, the year affirmative action was struck down. But the university chafed at the "top 10%" law and said its success relied on continuing segregation in many high schools. Left out too were many talented minority students from integrated, highly competitive high schools. So when the Supreme Court ruled in 2003 that universities may consider a minority student's race as a "plus factor" in admissions, UT officials added a new affirmative action policy to go along with the automatic admission rule. For these new students — about one-fourth of the freshman class — their race may play a role in who is admitted. The effect of the new policy has been modest. Nine in 10 of the Latino and black students admitted to UT in the last two years came as "automatic admits," not as beneficiaries of affirmative action. Nonetheless, UT's lawyers must now defend their race-based admission policy before a more conservative Supreme Court, which will revisit the issue thanks to Abigail Fisher, a white student from Sugar Land, Texas. She was turned down by the university in 2008 and says she was a victim of illegal race discrimination. The case poses a new question for the court, which will hear arguments next month. Can affirmative action be justified if a university is achieving diversity without using race? The answer could determine the future of affirmative action in college admissions in much of the nation. The top 10% law, recently amended to admit the top 8% of graduates, has not only boosted diversity, but it has also brought other benefits. Since the mid-1990s, the graduation rate at UT-Austin has risen steadily. Studies showed the graduates admitted under the law outperformed others with higher SAT scores. "It's had a profound impact. Before, about 10% of the high schools filled 75% of the freshman class seats here," said law professor Gerald Torres. Two years ago, the campus announced that for the first time, a majority of its freshmen were minorities: Latinos, Asians or blacks. And nearly all these new students earned admission solely because of their academic performance. But because the top 10% law drove admissions, university officials said they would prefer more freedom to select students who were extraordinary or special. For example, a student with high SAT scores who wants to major in architecture, science or music may deserve admission, even if that student did not graduate at the top of the class, they said. The university also says it wants to make room for minority students who did well in integrated high schools. "The racial diversity [arising from automatic admission] is mostly a product of the fact that Texas high schools remain highly segregated," university lawyers told the justices in briefs. Further, "the African American or Hispanic child of successful professionals in Dallas" who is not a top-tier graduate may be a better candidate for admission than a top graduate of a less-demanding high school with an "overwhelmingly Hispanic" or "overwhelming African American student body," they said. The Texas case is being closely watched by higher education leaders nationwide, many of whom worry the court is ready to strike down or scale back affirmative action. Since the court upheld affirmative action at the University of Michigan, the author of that 5-4 decision, Justice Sandra Day O'Connor, has retired and been replaced by the more conservative Justice Samuel A. Alito Jr. He and three other conservatives are likely to vote against use of "race conscious" admissions. All eyes are again on Justice Anthony M. Kennedy, a centrist who has consistently opposed policies that rely on race. Dissenting in the Michigan case, he said the court should force "educational institutions to seriously explore race-neutral alternatives," such as the top 10% law in Texas. Experts on higher education differ on whether a Texas-style automatic admissions law would work elsewhere. Florida and California have used such policies to increase diversity after their affirmative action plans were halted in the 1990s. The results have been mixed. In California, students who graduate in the top 9% of their high school class are admitted to the University of California system, but not necessarily to the campus of their choice. UC officials also give extra consideration to students who faced social and economic hardships. The percentage of Latino students at UC has been rising steadily, but officials attribute this mostly to the surge in the Latino population. Despite their best efforts, they say, UC Berkeley and UCLA have fewer black students than in 1996. UC President Mark G. Yudof was formerly the chancellor at the University of Texas. The automatic admissions policy "works well in Texas, but not so well in California," he said, because Texas has more segregated schools. UC's lawyers told the high court they had tried race-neutral policies, but achieved "limited and disappointing results." But Edward Blum, an activist against affirmative action who launched Fisher's suit, believes the success of UT's automatic admissions policy will show the Supreme Court that race-based policies are no longer needed. "Using a student's race to give him an advantage or disadvantage strikes most Americans as wrong," he said. "They are creating more diversity through the top 10% policy, and every black and Hispanic student can say, 'My race was not a factor in my admission.'" In this day and age, we need to make a college education a new baseline rather than just a high school diploma. And assuming that our schools are well funded and that children have access to quality teaching, ALL children are capable of learning the 4x4 curriculum that helps make them college ready. Tom Pauken responds to Bill Hammond on the subject of school accountability. Hammond encourages us to “stay the course” of the existing high-stakes testing system and “4×4” curriculum that have come to dominate public education in Texas. Implicit in this expensive testing system (the cost to Texas taxpayers is an estimated $450 million over a five-year period) and the 4×4 curriculum is the idea that everyone should be prepared to go to a four-year university. I call it the “one-size-fits-all” approach to education, which doesn’t acknowledge that students have different talents and interests. The current system clearly isn’t working all that well to prepare students to be “college ready.” And it is doing a particularly poor job for those students who would benefit from a greater emphasis on career and technical education at the high school level. So why should we “stay the course” of an overly prescriptive curriculum and a high-stakes testing system that haven’t delivered on its promises since they were first put in place in the mid-1990s? Rather than acknowledging that this state-mandated system isn’t working, the response from the defenders of the status quo is to roll out a new test, make a few changes to the accountability system and promise everything will be better if we just give it a chance to work. That’s what they said when TAAS became TAKS, and that’s what they are saying now that TAKS is becoming STAAR. What can we do to inject some common sense into the discussion on education policy? We need multiple pathways to a high school diploma — pathways that reflect student goals. Every student should get the basics. Then, for those students wanting to go on to a university, there would be a college preparatory curriculum with emphasis on math and science, or one that focuses on humanities and the fine arts. There would be a career-oriented curriculum for students so inclined which would prepare them with an industry-certified license or credential by the time they graduate from high school. I fully support holding schools accountable. But the current system does not hold schools accountable for successfully educating and preparing students; rather, it makes them beholden to performance on a single test. Success and accountability can be measured in a variety of ways. Pauken’s piece is a response to one that Hammond wrote, which may or may not have been in response to a column by Patti Hart, which continues a debate that flared up after Hammond and the Texas Association of Business threatened to take school finance hostage if they didn’t get their way. As I’ve said before, I agree with Pauken, and I’m not really sure why this is even controversial. But apparently this is how we do things these days. Bilingual education for the wealthy, no less. The fulfillment of Chris Whittle's latest dream. Nearly 2,700 students applied for a slot at Avenues: The World School. Shortly after the announcement that the school would open, Avenues received more than 5,000 applications from teachers all over the world, Mr. Whittle said. With salaries hovering around $110,000 (well above the average pay scale for a teacher in New York City), 120 teachers began this fall. How Do We Fix Standardized Testing in Texas? 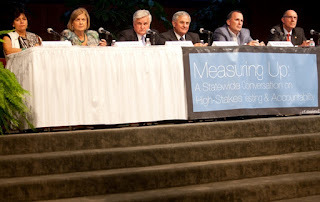 At UT last night, researchers, advocates and lawmakers shared some ideas. Maybe you’ve heard. There’s a tremendous backlash spreading across Texas—and from here to the rest of the country—against the high-stakes testing regimen we rely on in the state’s accountability system. More than 776 school boards, covering 85 percent of the students in the state, have passed resolutions calling for a more nuanced, less punitive approach to student and school assessment in the last few months. And that’s after the state began rolling out the new-and-improved testing system known as STAAR. During its last session, the Texas Legislature faced an angry mob that railed, in vain, against a budget that cut billions from public education. A whole new mob, even more pissed-off than the last, is forming around the issue of over-testing, and could force lawmakers to make some testing and accountability reforms. There are some serious differences of opinion, even among folks who agree the system needs to change. Last night on the University of Texas campus, five such leaders got together to share their ideas—a preview of the arguments we’re likely to see next legislative session. A few hundred teachers, activists, students and legislators turned up for the panel, which was hosted by the Lyndon B. Johnson School of Public Affairs. To begin, a pair of university researchers simply called for an end to the high-stakes system we have today, in which students’ test scores are used as the basis for judging schools and teachers. Angela Valenzuela, a UT professor of cultural studies in education, said it’s a battle she’s been fighting for more than a decade in Texas, because the pressure to test well—at the expense of a well-rounded education—falls disproportionately on Hispanic and black students. Rice University’s Linda McNeil, a critical writer about standardized testing’s effects on schools, really brought the heat, calling out the “big money interests” profiting off the way we run our schools. With statistics she said came from a legislative staffer, she offered a chart that said Texas spent $39 million on testing in the 2000-2001 school year, but will spend $93 million on it this year. “Public tax dollars need to go with public education. You have a lot of people seeing education tax dollars as their opportunity to get rich,” she said. 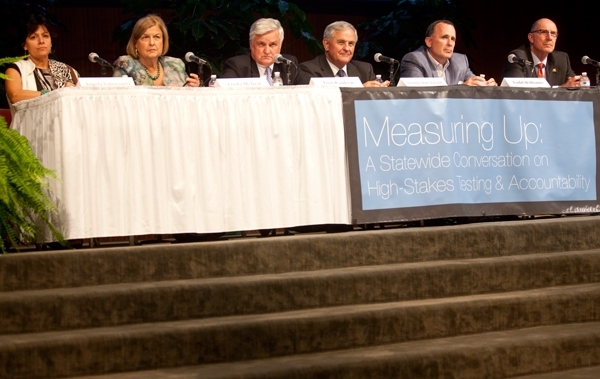 Todd Williams, education adviser to Dallas mayor Mike Rawlings and founder of a school reform group, Commit!, said he sees a particular problem in the way STAAR and TAKS scores are sliced to fit the needs of districts or the Texas Education Agency, and how hard it is to get meaningful test data. Parents might be heartened to hear their kid passed a state test, then be shocked to find out her “passing” score was under 50 percent. Of the 8,000 schools in Texas, he said, 93 percent of them were rated “acceptable” or higher by the state. State Rep. Jimmie Don Aycock, a Killeen Republican who has a good shot at chairing the House Public Education Committee next session, struck a broad, conciliatory tone. He said he doesn’t think it makes sense to judge students, teachers and schools by a single test, but he asked for people to share specific ideas about, say, how to save money on testing. He said his mind was open, and that he’s focused on making positive change, with concrete ideas that can survive in the Capitol. Perhaps without meaning to bring down the party, Aycock underscored why the most likely outcome is no change at all, or very little. “Simply saying ‘I don’t like what we’re doing’ doesn’t give us a bill,” he said. Also in this issue, Melissa Harris-Perry reveals the “Casualties in the Education Reform Wars .” In our special Occupy the Safety Net issue earlier this year, Pedro Noguera wrote about the struggles  of a West Oakland school, hit by the double whammies of poverty and austerity. Life Expectancy Shrinks for Less-Educated Whites in U.S. I wonder about the Hispanic subgroup and suspect is this were further analyzed by generational status or length of recency in this country if we would see U.S.-born Latinos/Mexicans as similar to poor whites or blacks since cultural assimilation, among other things, also means assimilating to behaviors that can compromise their health. A number of researchers, including UCLA's David Hayes Bautista has documented this in the area of health. Falls under what today is referred to as "the Latino Paradox" which is not really so much a paradox but reflective of the diverse generational/acculturational composition of the Latino population. Finally, this argues for the merits of universally accessible health care and higher educational opportunities that the middle- and upper-classes, particularly whites, have enjoyed to a much greater extent if we are to improve the health of our nation. Inklings of this decline have been accumulating since 2008. Professor Cutler’s paper, published in Health Affairs, found a decline in life expectancy of about a year for less educated white women from 1990 to 2000. Three other studies, by Ahmedin Jemal, a researcher at the American Cancer Society; Jennifer Karas Montez, a Robert Wood Johnson Foundation Health and Society Scholar at Harvard; and Richard Miech, a professor at the University of Colorado Denver, found increases in mortality rates (the ratio of deaths to a population) for the least educated Americans. Klein, the former schools chancellor for New York City, was hired by Rupert Murdoch to run News Corp.'s education division in July of 2010 and is now the CEO of Amplify. While the Journal -- which is also owned by News Corp. -- identified Klein as Amplify's CEO, neither the paper nor Klein himself disclosed that the company has millions of dollars in contracts for the very testing that is a central issue in the strike. In his op-ed, Klein downplays the teachers' rationale for taking action, writing that the strike "feels more about attitude -- 'the mayor doesn't respect us' -- than substance." In fact, the Chicago Teachers Union objects to a reformulation of the existing teacher evaluation system which would make standardized tests -- like those administered by Wireless Generation -- count for 40 percent of the score, which will be used to determine teacher pay and whether certain teachers will be laid off. From TASA.net, the website for the Texas Association of School Administrators. Imagine this. As of today, 793 districts in Texas out of 1,265 total in the state have adopted resolutions against high-stakes testing. Remember that in 1999, we had a whole federal court trial over this. Sure, the legislature over-reached in the context of HB 3 passed in 2009, but we already had a crisis—particularly impacting children of color well over a decade ago. 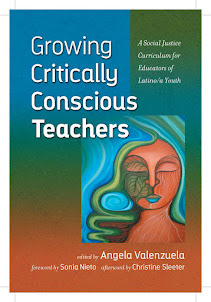 So this is long overdue and much welcomed, but let's own up to the fact that our community missed the boat by a long shot when so much was being done so much earlier (pre-NCLB) to address and counter what many of us already knew way back then was playing out in our children's classrooms and how they were being harmed by it. Powerful interests—including those within the public at large—are and have been at play here. The following is a list of school districts that have adopted a version of the Resolution Concerning High Stakes, Standardized Testing of Texas Public School Students. As of September 20, 2012, 793 districts representing more than 4.2 million students have notified us they've adopted the resolution. That's 77 percent of Texas school districts and 86 percent of all Texas public school students. The number following the district name is the ESC region number. Though individual districts may have made some modifications to the specific wording of the document TASA provided, the spirit of the resolution remained intact. Students at F. M. Gilbert Elementary School in Irving, Tex. 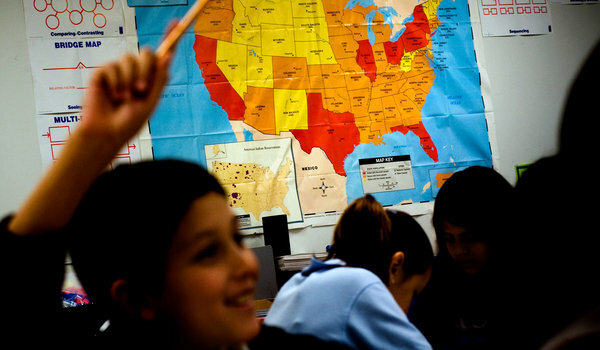 Segregation of Latino students is most pronounced in California, New York and Texas. This is really interesting and concurs with a lot of what we know about immigrant, Mexican mothers. I wonder though about the comparability of these mothers to those of other groups, i.e., white and Chinese. I would think that class was controlled for but this report doesn't say this explicitly. Will have to locate this study in the journal, Child Development. Pearson 'Education' -- Who Are These People?